It was with trepidation that news broke that ‘The Prisoner’ was being re-imagined as an audio series a couple of years ago, but thankfully any doubts were totally dismissed when the first four episodes of BIG FINISH’s re-imagining were released in 2015. Written and produced by Nicholas Briggs, the first set was very well received, and you can read The Unmutual’s review HERE. Series Two, due for release in September 2017, features another four episodes (three are again re-imagined, with one totally new story). In the media when speaking of music releases, the second set of songs from any artist is referred to as ‘the difficult second album’ and often not as well received as the debut. The opposite is true here. Briggs seems to have really found his feet, as have the actors with lead Mark Elstob clearly now more comfortable in his role. Other regulars return, such as the delightfully bonkers village voice, provided by Helen Goldwyn, who also, as before, becomes supervisor, barmaid, and all sorts of other roles. There are other returnees too, and some truly fantastic performances from first-time cast members, but I won’t spoil any of the surprises here as yet. In choosing a tightly-drilled and familiar ensemble, and becoming more comfortable with each episode he writes, Briggs has achieved what may have been thought of as impossible; he has created an entirely new village, heavily based on the original of course, but a ‘Prisoner’ series of his own, with new adventures for a new Number Six. I feel that with these episodes, Briggs’ ‘The Prisoner’ has stepped out of the shadow of the original series and now proudly stands on its own two feet. At times Briggs’ village is startlingly bleak and unpleasant. There’s a darkness which surrounds it, and exists in the mind of Elstob’s increasingly desperate and bedraggled Number Six. This is what McGoohan was telling us all along. Behind the bright colours, the umbrellas, and the ice cream, lies a nasty, tortuous truth. Rather like society, and life. Briggs grasps this completely. He clearly loves the series and so has shown it a great amount of respect in his writing, but also not resorted to easy remakes and predictable scenarios; he has not been afraid to take the concept to the darker level which an audio medium allows. When I first saw ‘The Prisoner’ in 1983, I felt that the series had been written just for me, such was the level of which I became absorbed into what I was watching. It was, and still is, unlike anything I had ever seen on television, it felt like a totally unique and individualised experience, and that whoever had come up with it (I didn’t know the ins and outs of series production at that time) had done so with me in mind. I’m sure all fans of the series feel the same; the series speaks to each of us on an individual level. The same is true of this new series of episodes from Big Finish. Briggs totally ‘gets’ the concept of ‘The Prisoner’ and it felt as though these new episodes were a bespoke concoction, written specially for me. ‘I Met a Man Today’ and ‘Living in Harmony’ particularly appealed to me not only in how they were delivered, but I felt I ‘got’ the concepts completely, just as Briggs has done with the original offerings. As such, if you’re a fan of the original series, and have an open mind, you will LOVE this! ‘A. B. and C’ and ‘Hammer Into Anvil’ act almost as a two-parter, and both contain some great moments of both comedy and drama, and take the premises of the original two episodes to a further extreme with some very interesting concepts, but it’s the first and last episodes of the set which should receive the biggest congratulations. Jamie Robertson’s music is again a highlight. 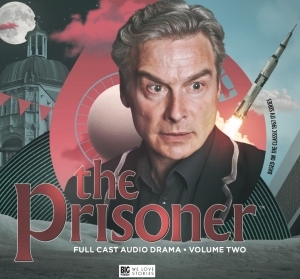 As I mentioned above, this ‘The Prisoner’ totally has its own identity, thanks in part to the ambience and tension that Robertson feeds into his music. Although there’s a slight reliance on twangy guitars (it was at times like listening to an instrumental album by Eric Burden’s The Animals, I guess no bad thing), it’s first rate stuff – and the Prisoner/GerryAnderson crossover theme something special – script Editor Jamie Anderson must be proud! BIG FINISH’S slogan is ‘we love stories!’, and series two of ‘The Prisoner’ is a triumph of compelling storytelling - I was totally absorbed throughout. It is entertaining, daring, and utterly enthralling. Despite the dark tones, there is plenty of amusement and derring-do as well, to thrill all manner of listener. There’s no bandmaster (played so amusingly by Barnaby Edwards in series one) this time, and I was so looking forward to the bandmaster, but I did enjoy the shopkeeper – oink oink! Big Finish have a habit of employing similarly aged, and trained, voiceover artists, and maybe it’s my ageing ears, but there are times when it’s hard to tell which character is speaking as many sound so similar. Elstob’s Number Six has a habit of doing lots of huffing and puffing and being perhaps a little over-emotional at times. Unlike McGoohan’s character, we know that Elstob’s man is a secret agent, but at times he doesn’t seem level-headed enough to be one, although I appreciate the extreme turmoil his character has gone through. With Danvers also being a bit of a bumbling buffoon, it’s a wonder the whole service hasn’t fallen apart. But that just adds to the charm of those characters. With that in mind, Elstob, fine though his performance is, spends too much time for my liking either sniffling, screaming, or sounding like he has a pair of socks in his mouth. I know he isn’t the same Number Six character that McGoohan was portraying in the original series, but nevertheless a little more calm might be needed in subsequent episodes. Therefore I’d like to see, in series three, Number Six ‘win’ more. The original series had episodes where Number Six was completely in control, yet it rarely feels that this Number Six is in control, and after 8 episodes some might feel that this is beginning to wear a little thin. Regardless, these are little quibbles and I can’t wait for series three, more please! Episode 1 is ‘I Met a Man Today’, based on the episode ‘Many Happy Returns’ and is a gripping, and yet at times touching, portrayal of Number Six returning home. Episode 2 is ‘Project Six’ and follows on from episode 1, and is (very slightly) a re-imagining of ‘A. B. and C’, looking at what happens when someone is deprived of their natural resources – a fascinating idea. Episode 3 is ‘Hammer Into Anvil’, seeing old friends in familiar surroundings, where paranoia is brought to a whole new level. As for episode 4, called ‘Living in Harmony’ (yet not based at all on the original), it sees the return of some much loved characterisations, and a quite brilliant new number two, complete with fruit juice carton, portrayed by Diedre Mullins, who is a real find in a very enjoyable episode; it’s out of this World! CLICK HERE FOR THE LATEST BIG FINISH PRISONER UPDATES, PHOTOS, AND NEWS!